The Afar People`s Party (APP) would like to draw your attention to the fifth national election intended to take place in May 2015 Ethiopia. In all its earlier cases the attempt to promote democracy through free and fair elections failed due to government harassments, arrests and killings, cover up by the systematic fraud managed by the ruling TPLF-led government. Thus, the result of the coming artificial election is known long before the election was carried out. The future democratic direction of the nation remains gloomy since the current regime has opted for non-competitive and oppressive sinister manoeuvre to cling into power. This critical situation in Ethiopia is well-known both inside the country and beyond. The shrinking democratic space, human rights abuse and unequal distribution of wealth and power in the country have raised the international concern. As a result most of international organizations have declined to participate as observers of the election. The Afar Region is one of most important regions for Ethiopia’s geopolitical and economic development. However, the Afar Region is the least developed, the most isolated without media outlet and marginalised region in the country. The combination of corrupted leadership, land grabbing, lack of basic necessities such as water, food, shelter, healthcare, and education is putting the survival of Afar people as a nation under question. When it comes to election the situation in Afar, where there is no local or international media coverage is more than critical and a desperate one. In fact, there has never been any proper election in the region and there is no future expectation to come. It is well known that the Afar region is marginalised, no election observers and only one party that competes with itself. In a traditionally open society of the Afars, freedom of expression and association is gravely denied to the extent that critical traditional songs are totally forbidden. That is the case for any formal association and party mobilisations. Independent NGOs are not allowed to operate and no other political parties allowed except the TPLF-affiliated Afar National Democratic Party (ANDP). Individuals are brought to power through clan affiliations which has triggered tribal conflicts. The displaced civilians are promised to return to their land if they accepted the election and students are promised scholarship and opportunity for employment only if they vote for the ruling party. Promises of promotion and compulsory party membership are the case for those who are working in public institutions. The government budget, vehicles and manpower are exploited for election campaign and used without accountability. 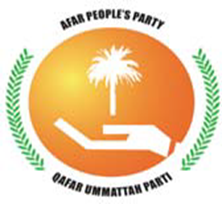 Therefore, Afar People’s Party nullifies the outcome of the election as illegitimate. We oppose any military involvement in the pretext of election. We call on our people not to submit to dictatorship. We say no to corrupt election. A forced election is a denied election that promotes dictatorship.